What You Do: 1.Before you begin the project, write a short list of “interview” questions or topics to discuss with your child. Example questions include: •What are your favorite activities to do with Dad? •What is your favorite thing about Dad? •What does Dad do to make you laugh? •What makes Dad so special? •What makes Dad a good father? •What special message do you want to tell Dad on Father's Day? 2.Explain the idea of a video or audio card to him. Show him the list of questions and give him time to think about his answers if necessary. 3.When he is ready, sit down with him and record his answers to the questions. Five minutes is an ideal length, but the recording can be as long or short as he wants to make it. 4.Transfer the recording to a blank CD or DVD. 5.Help him cut a sheet of construction paper to fit inside the jewel case. Ask him to write a short Father's Day message on the paper and decorate it as he wishes. He can also use a permanent marker to label the CD. 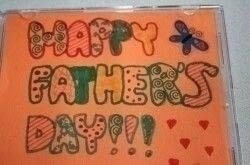 6.Fit the paper inside the jewel case and attach it as you would a greeting card to Dad's Father's Day gift.